I write this from my home-base of Los Angeles, CA as I take a travel break and my travel is house/tech-sitting within various areas in LA. Sprint recently launched it’s LTE (Long Term Evolution aka 4G) network in Los Angeles, California, so I took a Samsung Galaxy Note II for a test run on a bus across town to see how it does. The bus was a local, but there was no traffic at this time of day, so we moved rather swiftly. The Note II is a rather large screen and has a split screen feature so you can view and use two apps at the same time. I placed the Maps app on the top and, well, Facebook, as the bottom app. 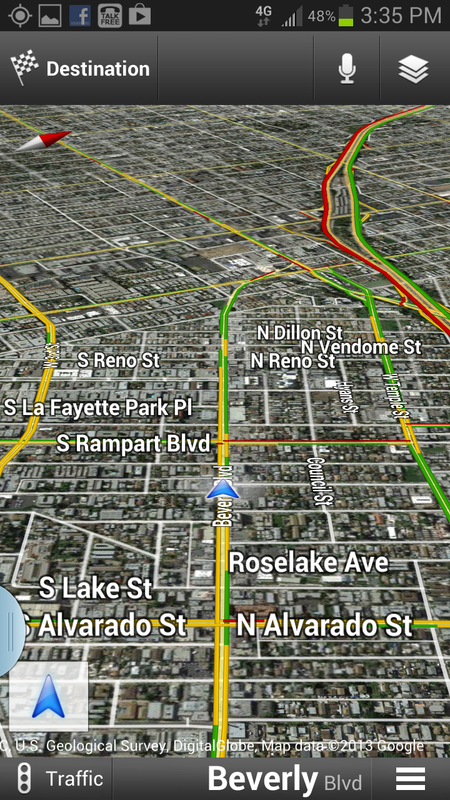 Maps loaded immediately. I figured out how to set it to track my movement. (It’s not highly intuitive.) I did that first by Destination, later just by navigation. Facebook loaded a bit slowly as it updated the status of all of my friends, which is something I am used to as that has always been slow in my mobile device experiences. 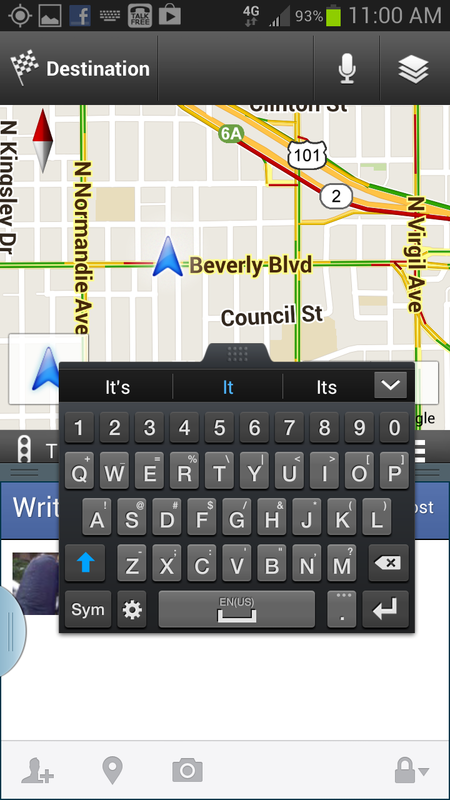 But even as that second app loaded, Maps’ navigation behaved perfectly. At times I zoomed in and watched as our bus moved a block, seeing the “me” arrow positioned perfectly on the street. I also experimented with layers of traffic and satellite views. The Sprint LTE network was able to facilitate communication to keep the navigation accurate for throughout the trip. Facebook loaded. I clicked Status to update my status to report my riding experience. 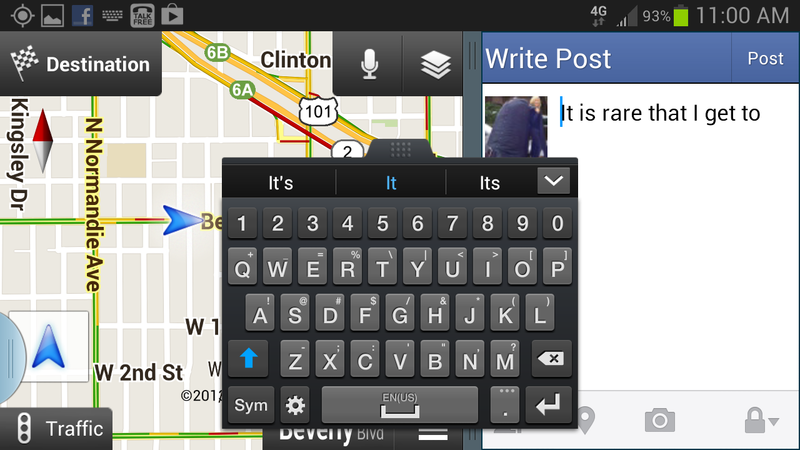 Clicking in the Status field, the Galaxy Note II provided a tiny keyboard on which to type. As I was using the split screen, when the keyboard appeared it covered my entire Status box, as you see in this screen shot. My first thought was that I would not be able to see my entry as I typed. But this keyboard sports a draggable tab at the top — and, impressively, I was able to drag the keyboard across the app window split. I also slid the split to show more map app. So I typed and updated my Facebook page as Maps kept me aware of the bus’s progress and I had no worries of missing my stop. Note for International Travelers: I report this, happy to see a data network that appears at first glance to do so well. However, if you’re traveling from another country, Sprint isn’t available to you unless you purchase one of their phones. And for those in the US seeking a phone with which to travel, unfortunately, Sprint’s version of the Galaxy Note II does not provide a GSM sim slot, so this phone cannot be used outside of the US.